PÊBThemes generation 4 is here! Confused? Click here. Please note this feature is for advanced users who are comfortable with CSS, if you’re unsure it’s better to stick to the font options Tumblr provides. 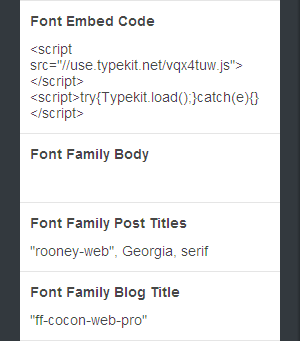 You can put any html in the ‘Font Embed Code’ option, usually fonts are installed as script or link tags. Then enter the css values of the fonts in the Font Family fields, each filled field will override its corresponding font option. You can also provide fallback fonts for browsers that don’t support @font-face in each Font Family field. To use your own custom fonts it’s advised to upload them to Tumblr’s static asset uploader and link to them from there. As it’s impossible to upload assets to your blog’s tumblr subdomain, to avoid CORS problems you should Base64 encode your font using a service like Font Squirrel’s webfont generator. © 2010 - 2019 Charlotte Dann at Pour Être Belle Themes. Terms and Conditions.